And then she was gone. 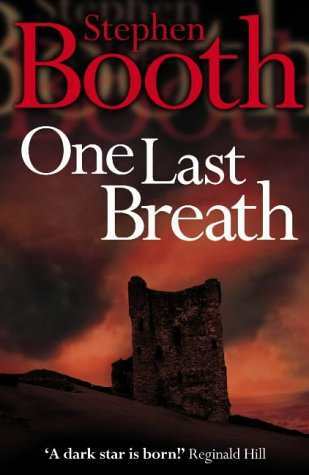 He heard the final scrape of air as it caught in her throat, and felt her last breath brush his cheek, as if a wisp of smoke had passed through the room. For a moment, she had taken his life in her mouth like a bubble of soap, swollen to bursting and smeared with light. And she’d punctured it with a sigh, that dying whisper. With one last breath, she had blown his life away. Mansell Quinn knew he’d heard her die. He pulled his hands away from her body, and stared at the blood staining his fingers and pooling in his palms. He turned them from side to side, and watched the blood slide over a coating of white dust on his skin. It ran across his wrists and trickled into the soft flesh of his forearms, teasing the fine hairs like the caress of a fingertip. He shook his head, trying to clear away the thoughts that buzzed in his brain like flies. He knew there were things he should do. Things he should do now. But he couldn’t remember what they were. Quinn’s mind was whirling and the room had begun to swing around him in dizzying arcs. Painful surges of adrenalin twitched in his veins, churning through his body as if poison had been pumped into his bloodstream. The words running through his head were no help at all. Murder. The children. The knife. He knew what the words were, but couldn’t get them in the right order. For some reason, she was wearing the lime-green sweater. A moment ago, the fabric had been stretching and twisting in his hands where it hung open over her breast. The colour of it looked garish next to the blood. But if someone had asked him what else she was wearing, he wouldn’t have been able to say. The sweater and the blood were all he saw. Quinn sank to the floor and knelt by the body. He could feel sweat soaking from his pores and running down his face like tears. Gas bubbled in his stomach until he thought he’d be sick. He reached to pick up the knife, thinking he should put it out of her reach, hide it, throw it away, keep it safe. He had no idea which. He took her wrist between his fingers to feel her pulse, though he’d heard her die and he knew she was dead. He flinched at the touch of her skin and the slackness of her joints, and he dropped her hand back on the floor, where it landed with a thud. Then he noticed the bloody smears he’d left on her arm; they formed a pattern of red blotches and streaks, like a mark branded on an animal. He looked up and squinted at the room, trying to place where he was. Her death had changed the world completely, so that nothing was familiar any more. Small impressions jostled his senses, like fragments of a broken picture. Music was playing somewhere, but he didn’t recognize it. A door facing him was open, but he couldn’t remember where it led. There was light coming through the doorway, yet it ought to be dark. A sweet scent hung on the air that he should know, but he couldn’t name it. It was his own house, yet it had become a place he’d never seen before. It was an alien landscape, painted in blood. Quinn looked down at her face, and the shock hit him a second time. He felt a desperate rush of hope that it might be possible to undo everything and turn the clock back, so that nothing had happened at all. What if he’d come home a bit earlier, or later? Or if he hadn’t been held up by the roadworks on Back Street? What if he’d left his tools in the car, instead of taking his time getting the bag out and bringing it into the house, worrying about thieves going by on the road in the night, instead of what might happen in the next few minutes? If he could take just one step back in time, her body might not be lying on the sitting-room floor, and the blood might magically fade from the carpet, like an advert for a miracle cleaner. She might stand up and laugh, and explain why she’d pretended to be dead. And life would go back to the way it had been before. But Quinn had heard her die. The sound of her last breath had convinced him, not the sight of the blood or the slackness of her joints. And he knew his mistake had been made much earlier – years before, when he’d first met her and the whole thing had started. And now his life would never be normal again. In a moment of silence, Quinn became aware of his own breathing. The sound of it seemed to fill the room, harsh and rapid, like the panting of a hunted animal, a rabbit in the jaws of the dog. He had never listened to his breathing before. He had never felt his lungs struggling to find air, or heard the shallow gasp that rushed across the roof of his mouth, like a cold wind inside his head. He didn’t like the noise, and he was glad when the music started again to fill the silence in the house. What was that music? Why was it playing? Quinn nodded at someone, though there was no one else in the room. He remembered that he hadn’t found what he was looking for. The words had replaced the others in his head. He still hadn’t found what he was looking for. But he hadn’t been looking for the lime-green sweater. That shouldn’t be here at all. Then he noticed the wetness soaking through his jeans to his knees. He stood up, staring at the purple stains on the denim, and at the blood spreading from the soles of his boots. It was so deep that it welled up from the carpet when he moved his feet. Unsteadily, he walked round the body, praying it might look different from another angle. But all he saw now were his footprints in the blood. The carpet had been gold once – a gold shadow pattern, one of the first things he and Rebecca had chosen when they were decorating the house. She’d be upset that the carpet was ruined. Quinn looked at his hands again, and the blood reminded him of something he should do. The phone stood on a table by the door. He dialled 999, and somehow remembered his address. He tried hard to listen to the voice of the operator, though he was distracted by the metallic smell of the blood on his hand and the slippery feel of the phone in his fingers. When that was done, he felt as though his legs wouldn’t support him any longer. He made it back across the carpet and collapsed into an armchair. His eyes were drawn to the clock on the wall over the mantelpiece. He knew the clock was important for some reason. He listened to its ticking, waiting for it to penetrate the fog in his brain and tell him what else to do. Finally, Quinn remembered the most important thing of all. The children. And he should have hidden the knife. The knife was dangerous. But then exhaustion overwhelmed him, and his head fell back against the chair. When the first police officers arrived at the house, they found Mansell Quinn asleep. He was dreaming that the whole world could hear him breathing.